If it looks just like mine, it’s mine. If I think it’s mine, it’s mine! 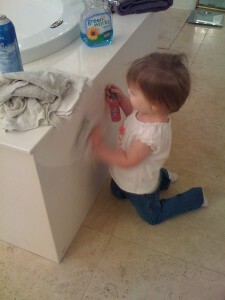 Cleaning can be a fun and productive game for your toddler to play! I have asked myself this question time and time again as my four children have grown each year. As a new mom with my first, I always assumed that 4 yrs old was just too young to be able to help mommy with the chores. With my second, I thought maybe they could help at 4. With my third I noticed that the desire to clean was motivated by the thrill of learning something new and they really seemed to enjoy contributing to the chores. And now, as I watch my fourth, I know beyond a shadow of a doubt that children not only have a desire to help as early as 2 yrs old, but they also think it’s fun! And surprisingly enough, they can do a pretty darn good job! The most important thing to remember is to keep it simple, keep it age appropriate and praise, praise, PRAISE! It is also a good idea to remember that the younger the child, the shorter spurts you should work in. Tackle one job at a time. Don’t throw three “to do” items at them at once or they will be easily discouraged and overwhelemed. A chore chart will give your little one an extra sense of accomplishment and a way to have everyone in the family recognize their effort and accomplishment. Wet wipes: It’s pretty simple, give them a wet wipe and point them in the right direction! At this age, kids love the magic of the wet wipe. It’s truly amazing…you find a mess, run the wet wipe over it, and presto! No more mess! Let kids have fun with this one. There really is very little damage they can to with a wet wipe in hand! Organize: This is a great opportunity to teach sorting skills to your toddler. Get several storage boxes and label them with a picture (i.e. car box, people/animal box, craft box, music box, etc.). Get them started by putting a few items in each box. They will get the hang of this quickly and hone a valuable skill in the process! Laundry: Sorting laundry can be a fun learning activity too. Let your toddler help you sort the laundry by color. Have three bins (light, dark, and whites). Put a few items in each bin to start with. You can teach your toddler colors while they help you with your chores! Laundry: Let your kids help you with the laundry by taking their bed sheets off of their beds and bringing them to you, putting them in the correct color bin. Kids at this age are also very capable and excited to both fold and put their clothes away on their own too. Remember that not all will be as perfect as you might like but don’t nitpick (it’s the quickest way to discourage a child from even trying). Positive encouragement and lots of praise will take them a long way to improvement! Dishes: Yes, though it may sound crazy to give a 4 year old a breakable object and let them walk across tile floor for any length of time, they are very capable of carrying out this task. Our 4/5 year old has become a very skilled “dish put-er away-er” at our house and knows better than my 8 year old where things go! Gardening: This is a fun one for kids. Put them in charge of watering your plants each day. They will love filling the water pot themselves and watching how their plants grow! Pulling weeds, cleaning leaves, and sweeping floors can all be easy activities for these guys. Definitely ready for some heavy duty work! These little ones can handle any window job you can dish out. Dusting is a definite fun past time (turn them loose in the house with a duster and watch the dedication!). Organizing: This is a no brainer for these guys, especially if you started at age 2. Laundry: Show them the ropes of your washer and put them in charge of a load or two. They can also dry dishes with the best of ’em! Vacuuming: Depending on the size of your vacuum and size of your child, this can be a lot of fun. Mopping: Cleaning my kitchen floor is one of my 8 year olds favorite activities! Gardening: With adult supervision and a little help, even lawn mowing and trimming the bushes can be a fun challenge for these guys! I am not a huge fan of letting kids handle any kind of heavy duty chemical while cleaning…especially if you are not planning to supervise the entire process. A suggestion, most things can be well cleaned and disinfected with a homemade solution of vinegar and water. It’s very gentle and you don’t have to worry about your kids around harsh chemicals. That being said, always supervise your young children, even if the only chemical they walk around with is a wet wipe. The best way to teach your little ones is by example and as they are cleaning alongside you, it will make it more fun and safe for them, less stressful for you and you’ll get a lot accomplished in the process! Remember, good habits start young. The earlier kids learn to contribute to the household maintenance, the easier it will be for you to maintain their involvement as they get older. Don’t get discouraged and remember that praise goes a lot farther than criticism! What jobs do your young children do around your home? Share your ideas, what works, what didn’t and everything in between in our forum discussion! Do we value our teachers or are they expendable? In what some claim to be a backlash from a large teacher march on the capital in March, Arizona Legislature has made some controversial changes to the way Arizona teachers are going to be treated. Some of these changes included removing seniority, salary and contract guarantees. One of the more surprising facts of this bill being passed is that state lawmakers did so without committee hearings or public comment, using an emergency 51-day special session to create a budget to push these changes through. • Districts are no longer required to give teachers notification of contract status for the following school year. Prior to Bill 2011, Districts were required to notify teachers by April 15th whether they were going to return the next year. • Districts can also now lower salaries mid year for select teachers without being required to take into account tenure. • If a teacher is placed on an improvement plan for inadequate instruction, they are only required to have 60 days of instruction now rather then the previously required 85 days. • If teachers wish to participate in union business during contracted time, they are no longer required to be compensated. Looking at the pros and cons, it is easy to understand why these changes have become so controversial. First, it is important to understand that Arizona is now vying for a very lucrative $4.3 billion “Race to the Top” federal education grant sponsored by the US Secretary of Education Arne Duncan which has very specific requirements and guidelines that states must follow in order to be eligible. Once such requirement is linking teacher salaries with student achievement. Good? Bad? Well, it may spur teachers to put more effort into their classroom teaching. However, it may also cause teachers to encourage cheating, more lenient grade awarding, etc. in an effort to keep their jobs. It may also unfairly alienate teachers that are working in severely underprivileged areas where parent and community support are in short supply and children naturally suffer to no specific fault of the teacher. • It ranks 35th in the nation for average teacher salaries. That’s $6,536 BELOW the national average! • To equal the national average spending per student, Arizona would need to increase their per student spending by 44%! • In order to be equal to the national average, Arizona would need to spend in excess of $2.7 billion! If we are not paying our teachers, not putting money into our educational facilities and materials, failing to offer our teachers any kind of job security and consistently watching our student population explode, then someone please tell me what person in their right mind would ever want to study and invest over $18,000 in education to become a teacher!!! With less qualified and fewer teacher applicants entering the field, how can this be good for our children? I recently spoke with a local 1st grade teacher in her second year that is already expressing her regrets and frustrations with the system. “I spend so much time administering required aptitude tests to my students, that I don’t have time to even teach them the concepts I’m testing on!” she lamented. She refuses to allow her parent helpers to assist her with these tests because she feels it puts the students at a disadvantage. “I had to go through special training to administer these tests” she confided, “and I don’t feel that the students benefit when different, unqualified people are randomly administering these tests.” With some teachers relying on untrained parent helpers to administer tests to their students, there is no consistency and great room for error. Not to mention the huge amount of time wasted. But then again, if Arizona were to win this “Race to the Top” grant money, perhaps great changes could be wrought to the benefit of both teacher and student. It certainly stands to encourage a great deal of innovative and forward thinking ideas about educational development as states fall all over themselves vying for the grant money. What do you think about the changes? Join the forum discussion on this topic and give us your thoughts. These changes, falling under House Bill 2011, prevent districts from considering tenure when making decisions about which teachers will be laid off. This also applies to rehires. Here are a few more changes taking effect with this bill…Districts are no longer required to give teachers notification of contract status for the following school year. Prior to Bill 2011, Districts were required to notify teachers by April 15th whether they were going to return the next year. Districts can also now lower salaries mid year for select teachers without being required to take into account tenure. If a teacher is placed on an improvement plan for inadequate instruction, they are only required to have 60 days of instruction now rather then the previously required 85 days. If teachers wish to participate in union business during contracted time, they are no longer required to be compensated. It ranks 35th in the nation for average teacher salaries. That’s $6,536 BELOW the national average! To equal the national average spending per student, Arizona would need to increase their per student spending by 44%! In order to be equal to the national average, Arizona would need to spend in excess of $2.7 billion! But then again, if Arizona were to win this “Race to the Top” grant money, perhaps great changes could be wrought to the benefit of both teacher and student. It certainly stands to encourage a great deal of innovative and forward thinking ideas about educational development as states fall all over themselves vying for the grant money. What do you think about the changes? Join the forum discussion on this topic and give us your thoughts. Please let us know if you are a teacher, parent or both in your comments.